The stars descended on the Indira Gandhi Indoor Stadium in New Delhi on Monday when Bollywood and cricket met the modern tennis legends on the final day of the International Premier Tennis League (IPTL). The Bollywood brigade that included Aamir Khan, Akshay Kumar, Deepika Padukone and Riteish Deshmukh played part in an exhibition match against World No 1 Novak Djokovic and Roger Federer. The other celebrities who turned up included Mohammad Azharuddin and Lara Dutta, actress wife of IPTL founder Mahesh Bhupathi. “The great moments I spent here will forever be in my memory. Thank you New Delhi! Tremendous crowd support! Forever grateful,” Federer posted on his Twitter page. On Sunday, on his arrival in India, Federer got to shake a leg with Bollywood legend Amitabh Bachchan and Deepika Padukone. The crowd had come to watch Federer and Djokovic take on each other but they did not mind a splash of Bollywood before the start of the match between Indian Aces and UAE Royals. The fun time on court began with Aamir and Federer on one side of the court while laughing at the other end was Sania Mirza and Djokovic. Djokovic's coach Boris Becker too enjoyed the show. 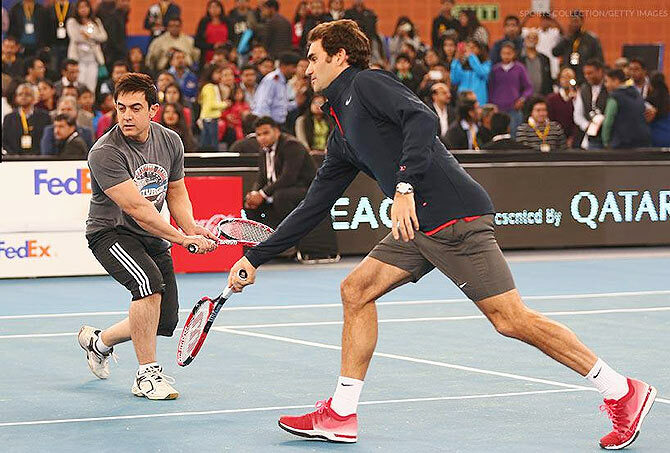 Aamir got the maximum time on court with the sport's biggies. Padukone, Akshay and Ritesh Deshmukh, who played chair umpire, joined the party later. Cricket legend Sunil Gavaskar, co-owner of Indian Aces, also spent a few moments on court with Federer.